The National Baseball Hall of Fame has four new members. Earlier tonight the Hall of Fame and the Baseball Writers Association of America announced Mariano Rivera, Mike Mussina, Edgar Martinez, and the late Roy Halladay have been voted into the Hall of Fame. They’ll be joined by Harold Baines and Lee Smith during induction weekend. Baines and Smith were voted in by the Today’s Game committee. Rivera retired with a 2.21 ERA — his 205 ERA+ is far and away the best in history among pitchers with at least 1,000 innings pitched (Clayton Kershaw is second with a 159 ERA+) — and a record 652 saves in 1,283.2 regular season innings. He also posted a 0.70 ERA and 42 saves in 141 postseason innings, and 31 times in those 42 saves he recorded at least four outs. Bonkers. A deserving Hall of Famer through and through. As for Mussina, he became a star with the Orioles and had more wins (147 to 123), starts (288 to 248), and innings (2,009.2 to 1,553) with Baltimore than he did with the Yankees. 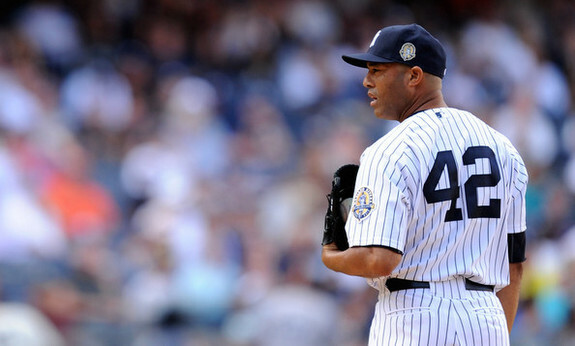 He was still a great Yankee, however, pitching to a 3.88 ERA (114 ERA+) in eight seasons in pinstripes. Mussina never won a Cy Young or a World Series, but he is one of the ten best pitchers since the mound was lowered 50 years ago, and now he’ll assume his rightful place in Cooperstown. I guess it’s fitting Martinez and Halladay are going into the Hall of Fame the same year as Rivera. Edgar is pretty much the only hitter who solved Mariano. Hit .579/.652/1.053 in 23 plate appearances against him. Good gravy. Halladay had a seven or eight-year stretch as the best pitcher in baseball and, as Tom Verducci wrote in 2013, Rivera helped Halladay refine his cutter. Verducci says the Yankees fined Rivera in kangaroo court for that. I was not sad when Halladay got traded to the National League. Not at all. Andy Pettitte received 9.9% of the vote and will remain on the ballot another year. I don’t think Pettitte is a Hall of Famer but I also didn’t think he’d receive such a low voting percentage. Five percent is needed to remain on the ballot another year and Pettitte cut it close this year. Bernie Williams and Jorge Posada dropped off the Hall of Fame ballot in their first year of eligibility in recent years. Pettitte gets another chance. Former Yankee Roger Clemens (59.5%) continued to gain Hall of Fame support in his seventh year on the ballot but again fell short of the 75% threshold needed for induction. So did Barry Bonds (59.1%) in his seventh year on the ballot. Fred McGriff, who the Yankees drafted then traded as a prospect, received 39.8% of the vote in his final year of Hall of Fame eligibility. The BBWAA did not vote him in, but don’t worry, one of the new eras committees surely will. The full Hall of Fame voting results are available on the BBWAA’s site. Next year Derek Jeter will join the Hall of Fame ballot and, like Rivera, he is lock for first ballot induction. Will he be unanimous? Maybe! Former Yankees Bobby Abreu, Eric Chavez, Kyle Farnsworth, Jason Giambi, Raul Ibanez, Lyle Overbay, Brian Roberts, and Alfonso Soriano are also due to join the ballot next year. Abreu will get some stathead support. I can’t imagine any of those guys coming close to induction though.